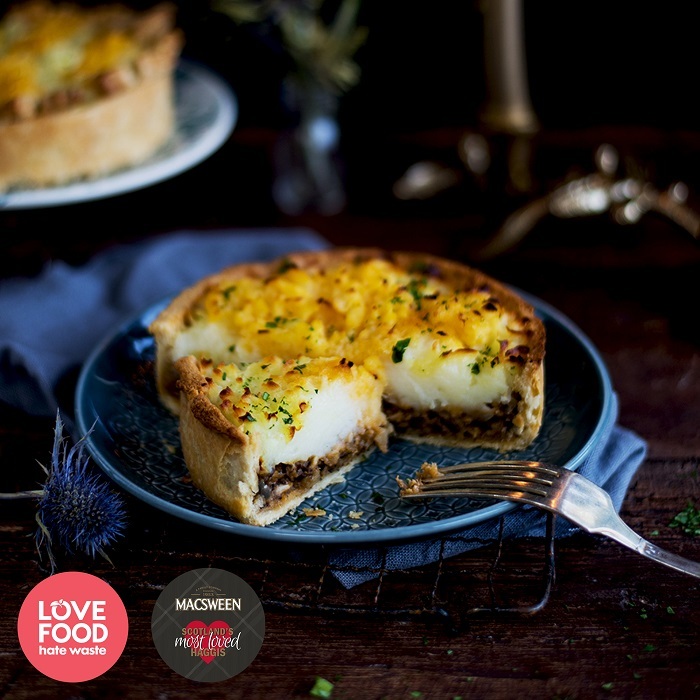 This hearty and delicious pie would be perfect for Burns night or any winter night! Making your own shortcrust pastry is easy but you can also use store-bought pastry and cut your workload considerably. Heat the oil in a large pan and sauté the onion over a low heat for five minutes until softened then add the garlic and cook for 2 minutes. Add the crumbled haggis and stir to combine. Stir in the stock, tomato paste, Worcestershire sauce and flour. Bring to a simmer and cook for 15 minutes. Taste the filling and season with salt, pepper and a little grated nutmeg to taste. Cool the filling before using. Boil the potatoes and swede in two separate pots until tender. The swede will need to boil for a while longer than the potatoes. Mash the potatoes with 25g of butter and enough whole milk to create a smooth mash. Reserve 50g of mash to mix in with the swede. Season with salt and pepper to taste. Mash the swede with 25g of butter and a little whole milk to create a smooth mash. Stir in some of the potato mash and mix together. Season with salt and pepper, to taste. Fill the pies with the cooled haggis, filling three-quarters of the way up. Transfer the potato mash to a piping bag fitted with a large star tip. Do same with the swede mash. Pipe the mash over the pies, alternating between potato and swede. Place the pies on a heavy baking tray. Reduce the oven temperature to 180C. Brush the pies with a little melted butter and sprinkle with the parsley. Cook for 30 minutes, until the pies are hot and the mash is lightly coloured.